On Sunday, March 6 BASIS Independent Summer participated in the New York Family Magazine camp series at the Berkeley-Carroll School. The BASIS Independent team, led by dean and summer principal Ms. Pugh and English teacher Mr. D'Amato, was excited by the high level of attendee interest in our Brooklyn program, particularly Traditional Day Camp and Mandarin. It was fun to see a lot of familiar faces of fellow schools and camps throughout Brooklyn. The families were excited to learn about the wide variety of programs and the BASIS.ed faculty and staff who will be leading the classes. In keeping with our love of science, we handed out cool cups that change color when you pour ice cold water into them. 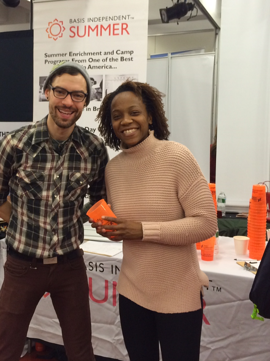 We encouraged event-goers to attend the BASIS Independent Summer Camp Fair being held on April 10 at our Brooklyn campus. It's the perfect opportunity for interested parents to meet the summer program teachers while seeing demonstrations of what students can expect to learn in our program. Join us on April 10 for our special Camp Fair to see what BASIS Independent Summer has in store for your students! Are you ready to register for summer programs? For questions, please contact our Director of Summer Programs, Matthew Beller at 347-630-1921 or Brooklyn-Summer@BASISindependent.com.